Gameplay of Batty Barrel Bandit. 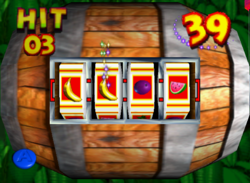 The player must roll a barrel slot machine and attempt to line up four Bananas on each of the four reels. This process must be done three times. The slots also depict watermelons, grapes, pineapples, and coconuts. If the player lines up one of these fruits, the machine resets itself. The number of turns is indicated by a hit counter at the top-left corner, and it decreases by a number for every instance where the player lines up four Bananas. Like the other Bonus Stages, Batty Barrel Bandit has a time limit, which is a little bit shorter in some later challenges. The player loses the jackpot challenge if they do not meet the criteria. If the player successfully gets three Banana jackpots, the Kongs win a Golden Banana (except in Snide's HQ). There are three different Bonus Barrel challenges. The fourth challenge is at Snide's H.Q., which the Kongs can play after they obtain all 40 Blueprints. This page was last edited on August 27, 2018, at 09:26.